Hurricane Spin Broom Reviews - Is it a Scam or Legit? With the power of triple brush technology, Hurricane Spin Broom promises to help you easily pick up debris from any hard floors, without the need for power. Hurricane Spin Broom is a handheld, cordless, lightweight spinning broom that promises to work on every hard floor, regardless whether it’s wood, laminate, or tile. The manufacturer claims that Hurricane Spin Brush’s triple brush technology rotates with cyclonic action, allowing you to pick up any mess with ease in just one pass. In addition, Hurricane Spin Broom promises to deliver revolutionary swivel action for increased maneuverability and a no-touch, large-capacity bin that empties in seconds. Which should be a breeze, since the broom weighs less than two pounds. You’re here because, once you sweep (pun intended) all the marketing hype aside, you want to know if Hurricane Spin Broom is the real deal, or if it will be a waste of your money. Stick with us, and that's exactly what we’ll help you decide—starting with price. How Much Does Hurricane Spin Broom Cost? Main Offer – Includes 1 Hurricane Spin Broom for $19.99 plus $9.99 S&H. The deluxe offer adds 1 LED Light and 2 Extra Brush Heads for an additional $9.99 fee. Special Offer – Includes 2 Hurricane Spin Brooms and 1 Sticky Buddy for $29.98 plus $9.99 S&H. The deluxe offer adds 1 LED Light and 2 Extra Brush Heads for an additional $19.98. Spin Bundle – Includes 1 Hurricane Spin Mop, 1 Hurricane Spin Scrubber, and 1 Hurricane Spin Broom for $99.97, plus free S&H. The deluxe bundle adds 1 Sticky Buddy for an additional $19.98. According to the manufacturer, Sticky Buddy is a reusable sticky roller that removes hair and lint, works on “virtually any other surface in your home,” and rinses clean when you’re done. All Hurricane Spin Broom purchases come with a 30-day refund policy, less S&H. to request one, you’ll need to call Bulbhead (a division of Telebrands) customer service at 855-668-1655. Can you get anything similar for this same price? Are There Other Products Like Hurricane Spin Broom? The HighYa team has reviewed more than 800 ASOTV products to date, so here’s a fun fact you might not have known: It’s not uncommon for companies to “share” products. In other words, we regularly encounter two products from two different companies being sold at the same time, and which are often indistinguishable from one another. 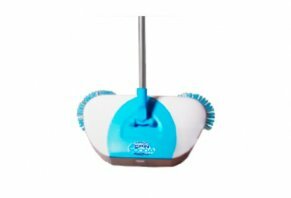 In this instance, you can see that, except for some cosmetic differences, Hurricane Spin Broom appears to be functionally identical to Turbo Tiger Sweeper, as well as the EasyEdge Lightweight Hard Floor Sweeper sold on QVC. While Turbo Tiger costs about the same as Hurricane Spin Broom, the EasyEdge is currently priced meaningfully lower at $16.44 plus $5.50 S&H. Now, if you read our article for Turbo Tiger Sweeper, you know that we were left with several important—but answered—questions after our research. Is it the same scenario with Hurricane Spin Broom? We called Telebrands’ customer service number and spoke with a very friendly rep, who let us know that Hurricane Spin Broom is not powered, whether via replaceable or built-in batteries. First, keep in mind that (while we didn’t test it firsthand), Hurricane Spin Broom’s lack of a motor could mean that it’s not very powerful. On the QVC website, you can see it in action for yourself—and based on this, we’d be concerned it wouldn’t pick up much more than flat, relatively lightweight items. Second, while the manual power generated by Hurricane Spin Broom might technically create cyclonic action, it’s important to point out this isn’t the same as the cyclonic suction created by many modern vacuums. Unfortunately, the service rep didn’t have any information about Hurricane Broom’s handle length or the dustbin size. Again, though, QVC lists the dimensions at 43"H x 12-3/4"W.
Finally, as you can see from the identical competition, as well as for other sweeping devices, Hurricane Spin Broom’s swivel steering technology doesn’t appear quite as “revolutionary” as the manufacturer might’ve made it seem. Based on all these similar models, is there anything we can glean from their customer reviews? Is There Customer Feedback For Hurricane Spin Broom’s Competition? While Hurricane Spin Broom was too new at the time of our research, the EasyEdge Hard Floor Sweeper had 330+ customer reviews on QVC and an average rating of 3.7 stars. On the other hand, common complaints referenced difficulty using, less-than-stellar quality, and that it didn’t perform as well as in the product demo. Granted, EasyEdge and Hurricane Spin Broom seem to come from different manufacturers, so we’re not attempting to set up any expectations. Instead, we’re only reporting the facts. What’s the Bottom Line About Hurricane Spin Broom? Compared to Turbo Tiger, Hurricane Spin Broom’s customer service representative was able to provide us with some additional insight into the product. And what they weren’t able to assist with, we were able to glean from EasyEdge’s listing on QVC.com (including its extensive customer feedback). Taken together, it seems like we have a fairly clear picture of what you might expect from Hurricane Spin Broom (or, at least as clear as possible without testing it firsthand). Are you looking for something that’s lightweight, doesn’t have to be charged, and can pick up relatively small items, especially near baseboards? If so, we can’t foresee any reason why Hurricane Spin Broom wouldn’t deliver. But will it work exactly like the commercial makes it seem? Is there anything about it that’s “revolutionary”? This remains to be seen. But if it doesn’t meet your expectations, you can always take advantage of Telebrands’ 30-day refund policy. Just remember that you’ll lose any S&H charges, as well as any fees associated with the deluxe offers. It worked for about 30 seconds. After the initial 30 seconds, the brushes don't turn and it doesn't pick up anything. I'm returning to the store today. It's just a piece of junk. Don't bother buying this product. Purchased from Bed Bath & Beyond. I am very disappointed because the advertising makes it look like a wonderful cleaning tool. Should have read these reviews before asking for one as a gift! I wanted it to pick up dog hair from wood floors; dog hair clogs up the rollers, as well as now the brushes that are to pull the dirt into the other brush will not turn, so consequently, nothing is getting picked up! I called customer service, which was a joke! They asked if I was using and cleaning the brushes correctly! And, continually told me that he was "sorry for the inconvenience." I don't care about the sorry, but would very much appreciate if the problem was solved. Why are companies allowed to continually rip the consumer off? An absolute waste of money! I ordered this product based on the ad video in the official site. The video is a scam because it doesn't show the real performance. Simply it's a useless and noisy plastic piece. I bought this item online in Walmart, but I had to contact the vendor, Purple Turtle Products, to start the return process. I explained to them that I didn't want the product anymore because it is not as was described and claimed a full refund. I received a response from Barbara Seibert: "Yes you can return, but you will be responsible for the return shipping." So, the product was $19.95 and I paid $10.33 for the shipping. The worst customer service I ever had. I can say that every review I read so far I've experienced. Literally, the last review about cleaning it well, I'm going to try that and see if it works because otherwise, it's doo-doo. I must say it's a great great idea because when it does work (because it does work sometimes), it definitely is lovely, so if they can figure out how to get them wheels to turn like they show it on TV constantly, then it's a great product. Because it does pick up big stuff too, but you got to work hard and maneuver and go back and forth and do all kinds of stuff, and it finally does do it. It's a great idea if they can get it to work. I wish they could because when it does work, I love it, and I will tell the world to get it, but since it hardly ever works like it's supposed to, I wouldn't recommend it. I wish I had kept my receipt to get a refund. It won't empty at all. What a big con to rip poor people off. I will be chucking it in the bin. The outer round brushes lay flat on the floor, so far that they do not spin. The center brush pushes some things into the receptacle, but not enough that you do not have to do some manually. This is definitely NOT worth the money. Another RIPOFF. Total waste of money. Wheels don't turn on a regular basis. It does not pick up very good. When you pick it up to go empty the dirt that you may have been lucky enough to trap, it falls back on the floor. If I had the box and receipt, I would definitely return it for a refund. I found this product to be totally useless. I have tile floors and it kept catching on the tile edges so I gave it to my niece who has vinyl floors. She tried it and threw it out. I have had for a week now, and it barely sweeps the tile floor, and rugs are very hard to get to; only gets about 1/2 of the mess and will not even turn on short nap carpet. The very bad product, not worth the money. I should have ordered a Bissel from Walmart or Big Lots for less money. I don't believe it was meant to be used on carpet, just some common sense here as far as that goes. The wheels hardly spin. I bought this mostly for dog hair like advertised, but the hair gets stuck in the wheels that already don't spin. One of the worst purchases I've ever made. And $19.99 isn't a bargain to me. Write a Review for Hurricane Spin Broom!